What does Talk To Me 100 ® do? Talk To Me 100 ® provides a core vocabulary of high frequency use words easily accessible in all environments to those individuals needing verbal communication. There is no need for a computer, software, battery charger, on/off switch, volume control, programming skills, changing picture symbol displays or pages. This device offers an opportunity for effective functional interactive communication for a wide variety of application: individuals with developmental delay, visual needs, autism, cognitive impairment, hard of hearing, brain injury, motor planning difficulty, cerebral palsy, apraxia, selective mute, voice, speech and language disorders, foreign language, beginning language learners. The relative ease of use will allow more individuals to communicate more frequently. It will promote faster language acquisition and increased verbal expression using the person’s natural voice in his/her primary language, relying less on the invention. As the language learner’s skills increase, this invention provides the foundation and knowledge for the listener and speaker (both communication partners) to transition to more complex technology or their natural voice and language strategies as needed. Why do we need Talk To Me 100 ®? Currently, there are a wide variety of voice output devices available for those people who face difficulty with verbal language expression. Recordable single message buttons use a single switch. More complex devices with 4 to 12 message locations with multiple levels have multiple overlays. There are computers with complex dynamic displays with over 100 locations with dedicated software for use with touch screen and a variety of switches to use with scanning methods of selection as well as hand held computers and smart phones. In other words, each person has a different, custom voice output strategy tailored to their changing language needs with changing picture symbols and/or words to coordinate with each unique activity throughout each day. This attention to the details of the multiple needs of each person requires extensive training of teachers, therapists, aides, parents, adults and children. Concentrated periods of time apart from the regular classroom or home, substantial financial output along with downtime for repairs and those related costs means loss of time from effective means of communication. There is no single voice output device that uses a partner assisted communication strategy that is available universally to train communication partners or guides how to increase functional, effective, interactive verbal communication with more than 100 of the most frequently used words. This invention provides a strategy whereby participants naturally practice their verbal skills while engaged in educational and leisure activities. This voice output device is provided with prerecorded word(s) where each word corresponds to a switch/button and a location on the overlay indicated with visual symbols. When pressed each button provides the sound of a single word (or words) that may be combined with a sequence of words to express the individual’s wants, needs and desires. The static composition of these symbols with corresponding voice output locations is constant, reliable and predictable, providing a foundation for emerging verbal skills for both communication partners to use. It has the capacity to use words for all functions of language: to imitate, question, initiate, respond, comment, answer, describe, organize, predict, greet, retell, confirm, encourage, clarify, reject, remember, correct and persuade. These words are permanent and cannot be erased, deleted or rerecorded. This device is designed to be used with a partner assisted communication strategy outlined below. The design of the visual display is essential to the function of the device. The symbols are simplistic in design, using basic shapes to convey meaning and eliminate distracting visual information. Parts of speech are color coded and arranged on the overlay into preferred groupings to reinforce both the meaning of the words being spoken by the audio output and the location on the overlay, for example nouns are yellow and are placed in the first 2 columns, verbs are green and comprise columns 3-5, prepositions are purple in columns 6 and 7, and adjectives are blue and positioned in columns 8 and 9. Clarifying words are white and placed in column 10 and around the perimeter of the overlay. Questions are grey and arranged in the top row of the overlay. Language typically develops first with nouns, then verbs, prepositions and adjectives as arranged from left to right on the overlay. 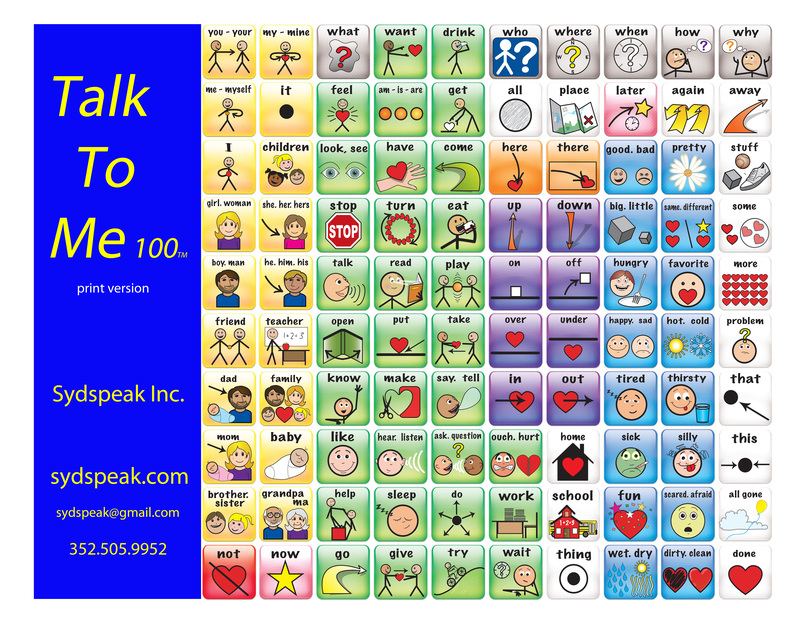 Talk To Me 100 ® is particularly useful to fit a variety of language development needs. Development of questions comes later in the process of language learning and questions are placed on the top row of the overlay beginning with the word “what” because it is developmentally the first question word to be understood and expressed by typically developing children. Acquisition of question words progresses to “who, where, when, how, why” sequentially. Placement of the words: “you-your” at the upper left hand corner is critical. People scan and read in English from left to right beginning at the top to bottom of visual material. The purpose of this tool is to focus on the learner and natural use of the word “you” (as opposed to “I”) to embed high frequency use of this word to engage the learner as quickly as possible. The one negative word, “not”, is red in color and placed in the lower left hand corner of the display. Foundation for emerging literacy skills are embedded in the arrangement of the symbols as students learn to visually scan from left to right and top to bottom. The printed word is added to the symbol to reinforce emerging literacy skills. Some language learners may identify with the printed word before the picture symbol, making it critical for their communication development. the most frequently used and some of the first words children develop naturally. Some words have been omitted because they do not enhance interactive social communication. Words such as “no, yes, hi, bye” are among the first words learned and are definitely powerful. Even though these words are most common, they do not promote conversation and can easily be communicated through means other than verbal expression. A few symbols have 2 words, “good, bad”. In context the meaning becomes clear, but also allows for flexibility of meaning and encourages use of ‘not’. For example, if something is “not bad”, it may also be “good”. The peripheral words that may be associated with performing a specific activity (like working with arts and crafts) such as “glue, scissors, paper” are not needed when using Talk To Me 100 ®. One might go for days without needing to express the word “glue” or “paper”. Whereas there are frequent uses of the words “put on” and “cut” throughout every day as well as during arts and crafts activities. The voice output device reinforces the use of words such as “put on” and “cut” rather than the peripheral words because mastery of the more frequently used word is given priority over less often used peripheral words. It is possible to retell basic stories using the 100 word core vocabulary. It may not be grammatically correct, but conveys the appropriate meaning and provides information to the listener. Talk To Me 100 ® provides for a multi-sensory approach to language learning. The repetitive motor planning required to select a specific location along with the tactile feedback (touch) from pressing the button reinforces the muscle memory and association with the corresponding visual (symbol) and auditory (word) cues. Multiple activations of a single button for a variety of activities with different communication partners are important. The behavior reinforces the voice output from the device and the natural voice of the speaker. This process will make the necessary neurological connections in the brain for long term memory, thus increasing probability for verbal expression. Whereas voice output devices currently available address the differences in language learners, this universal voice output strategy identifies the similarities of language learners and allows for a natural integration into daily routines. Most strategies have a “bottom-up” developmental model, building on small increments of language until a developmentally appropriate level is reached. This voice output device communication/teaching strategy has a “top-down”, activity based model. This strategy provides core language from the beginning, gradually decreasing assistance from the partner as the learner acquires increasing verbal skills necessary for effective interactive communication. The learner becomes less reliant on the device and more independent using natural voice. Typically, once a speaker has achieved the ability to use 100 individual words and combine those words in 2-3 utterances to express novel ideas, expansion of verbal skills occurs naturally. Research reflects that voice output device usage does not inhibit natural verbal skill development, but rather increases the desire and skills required for natural verbal expression. Just as some children learn to walk before they crawl, some may say “stop” or “who” before “dada”. This approach follows the child’s lead and meets the child at the point of readiness to learn.